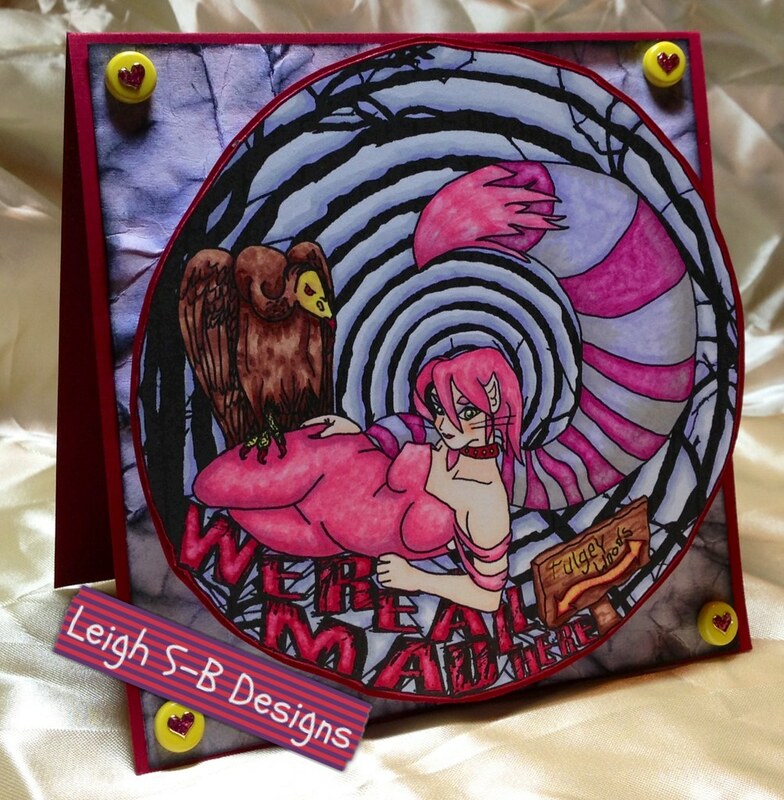 Velvet Paw Creations: Rocking Cheshire Cat Card - Smeared Ink GDT! Today I'm sharing a kinetic card featuring Smeared Ink's digi image, the Cheshire Cat! Such a fun and totally bizarre image to create with, I love it :0). I made the card as my GDT sample for their Smudgy Antics challenge, Crumple It, which starts today. Print the image onto Neenah Solar White cardstock and colour using Disney's colour scheme with the following Copics: RV10, 13, 17, C0, 3, W3, Y13, R46, YG06, BV01, 02, 04, E000, 01, 02, 13, 15, 17, 18 and the 0 colourless blender. Cut out the image and adhere it to a sheet of dark red cardstock and cut out leaving a narrow border. Crumple up a square piece of white cardstock and apply Shaded Lilac and Spun Sugar Distress Inks with a foam ink applicator tool. Apply Black Soot DI to the edges. Make a square folded card from the same dark red cardstock and adhere the crumpled mat to it with glue and add yellow brads to all 4 corners. Embellish the brads with sparkly pink heart jewel stickers by Stampendous. Adhere the Cheshire Cat to the card with a mini card spring by Papermania Docrafts. The spring action really adds to the bizarreness of the image when it spins and wobbles! I'm having some computer tech issues at the moment so I'm hoping to add a little video clip of it in action soon. Hey girl, this card Rocks for sure!! I love it! I love AIW stuff any ways! Love your coloring! Great job on this!